Kabubo-Mariara, Jane, Richard Mulwa and Salvatore Di Falco. 2016. 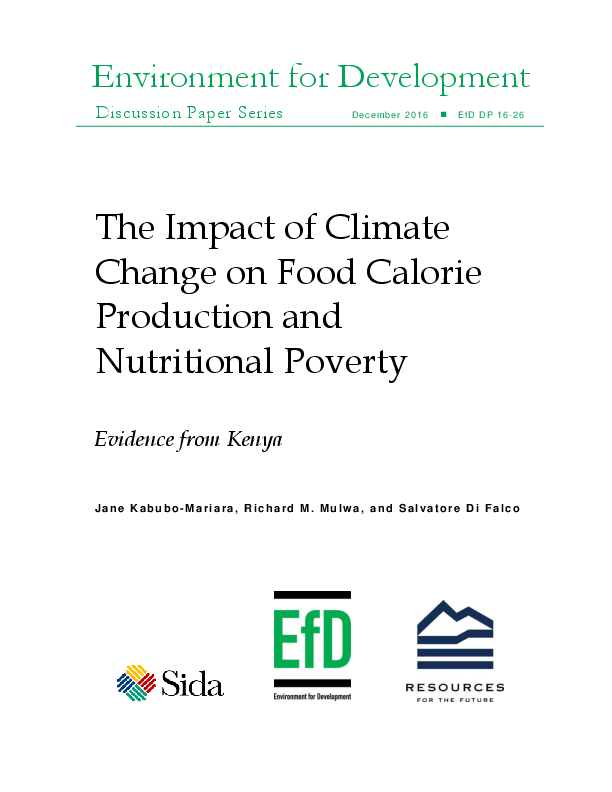 “The Impact of Climate Change on Food Calorie Production and Nutritional Poverty: Evidence from Kenya.” EfD Discussion Paper Series 16-26. We investigate the effects of climate variables on food and nutrition security and the probability of a household being food and nutrition insecure. Panel data methods from three waves of the Tegemeo Institute Household survey data (2004, 2007, and 2010) are used. Climate change is measured by long-term averages of temperature and rainfall, all measured at the peak precipitation month and extreme values of the Standardised Precipitation-Evapotranspiration Index (SPEI). The results suggest non-linear effects of climate variables on kilocalories produced and on the probability of being food and nutrition insecure. They further suggest that increased moisture is beneficial for kilocalorie production, but excess moisture will be harmful. Overall, the results portray the vulnerability of smallholder farmers to climate change. Technology adoption and adaptation to climate change, as well as household/farm assets, increase kilocalorie production and reduce the probability of being food and nutrition insecure. The findings point at policies related to mitigation and adaptation to climate change, adoption of improved farming technologies, and improved market access.